The 20 Swiss Franc is a historic coin that dates back to the early 19th century. There are two types of historic 20 Swiss Franc coins, Libertas Helvetia, which was minted between 1830 and 1896, and the more common Vreneli, which was minted between 1897 and 1949. Both are considered highly collectable and make for a reliable investment. All coins minted after 1936 were restruck once gold coins were no longer considered legal tender in Switzerland. 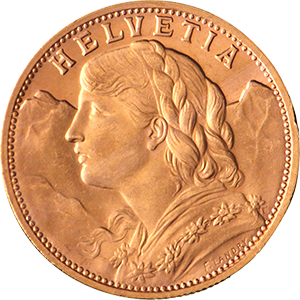 The formal name for the Vreneli Franc is “Tete D’Helvetia” translated as “Head of Helvetia”, the feminine national personification of Switzerland, which sometimes leads to confusion between the two types of Swiss Francs. If in doubt, the date the coin was struck is a reliable indicator of the coin’s type. Helvetia was the original Roman name for Switzerland and is still used by the country on its legal tender and as a shorthand, broad description that is recognised by the country’s four native languages. Native languages interestingly still refer to Switzerland by some variation of Helvetia, such as Irish, Greek and Romanian. In Germany, which has large Swiss populations in many of its border towns, Helvetian is often used in a poetic sense to describe the Swiss, although “Schweiz” remains more common. 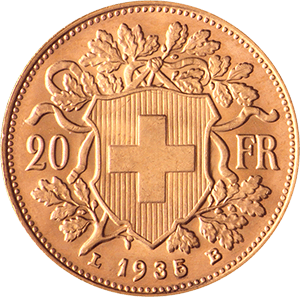 The 20 Swiss Franc coin has a purity of 21.6 carats (0.1867oz of fine gold) making it one of the purer gold coins in the world. It weighs 6.4516g. The coin itself has the previously described head of Helvetia (sometimes referred to as Swiss Miss) on one side with the picturesque background of the Alps behind. On the reverse is the iconic Swiss coat of arms. The coins themselves trade above the melt worth and are known to maintain their value over the long term, making them highly tradable items.